On Twitter the other day, Radha of The Polish Owl said she wished for summer because she missed neons. Which made me think, why can't neons be wintery? I had just picked up some flannel pajama pants (on clearance!) 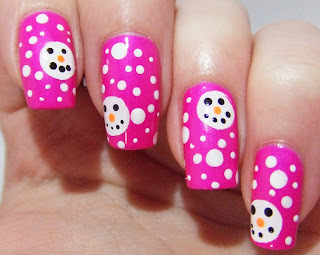 that were HOT pink with snowmen faces. I decided that it would make an adorable manicure. Though I did turn up the neon-osity a bit. Regardless, a very wintery neon manicure! 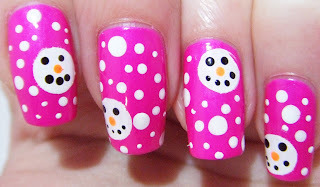 if you try this, use the smallest dotting tool/toothpick. The smiles turn out better.